Ninety-nine years ago, in 1884, Walt Whitman bought the little house at 328 (now 330) Mickle Street, in Camden. For the first time in his life, he had a permanent place of his own, paying rent to no one and living off no one’s generosity. Though he lived here only eight years, it became fixed in the mind of the world as his home, the place one went to pay one’s respects to Walt Whitman. As we prepare for the centennial of that event, we can cite several proofs that the years—especially the last three decades—have been good to Walt Whitman. His works are available in a variety of editions, from the popular to the scholarly. His home in Camden is open to visitors from around the world, who come (as his original visitors came) hoping to get a personal glimpse of the man behind the remarkable poems they have read. Most important to Whitman himself, judging by his remarks in the Preface to the first edition of Leaves of Grass, might be the fact that so many younger poets find a patron, protector, and spiritual father in him during their own struggles to create an identity in poetry. The Mickle Street Review exists to encourage this last way of remembering Walt Whitman, as well as to provide a home for reviews and criticism likely to be of interest to our readers. In this, our fifth issue, we celebrate our own continuing maturation as a literary magazine, having (like Walt) neither shame nor false modesty. We offer our readers a sampling of the work of fifteen poets, each poem chosen first for its excellence and second for what it might say about Walt Whitman. We offer four essays which provide new insights into the history, theory, and interpretation of Whitman’s poetry. We offer a selection of reviews to guide the reader’s further exploration of the work of contemporary poets, including some represented in this issue. And finally, we present a remarkable story about the homecoming of a young woman who quotes Walt Whitman in her defense of her freedom of spirit; though she loses her lover, she keeps a richness of language and fantasy this is pure Whitmanesque. Plans have been laid for two future issues of theReview. The next, #6 (1984), will be organized around the theme, “Whitman and Work.” Issue #7 (1985) will examine “Whitman and the Earth.” Submissions are invited. 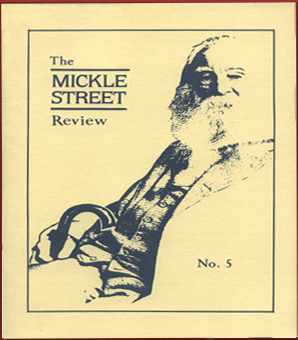 This issue of The Mickle Street Review was published with the assistance of grants from Rutgers University in Camden, from the Walt Whitman Association, and from the Coordinating Council of Literary Magazines with monies provided by the National Endowment for the Arts and others. Letter to Kazin James Magner, Jr.
To Paul Metcalf for permission to reprint his essay, “Whitman and Melville,” which has also appeared in The Third Berkshire Anthology, ed. David Emblidge (Lenox, MA: 1982), and to Alexis Levitin for his translation of Egenio de Andrade’s “Walt Whitman and the Birds,” which appears in the Spring 1983 issue of Modern Poetry in Translation. Cover: Adapted by John Giannotti from a photograph of Walt Whitman taken in 1889.